friend recently did massive pheo. i asked him if when he spoke to the patient in icu the next day, did the patient say. "pheo not! it is but i!" It looks like an adenoma on the CT, and it looks smaller than 6 cm. Why did you take it out? If its density on unenhanced imaging didn't totally let you declare it to be a benign adenoma (i.e., if it were lipid-poor), why not go on to a washout study to characterize its enhancement pattern or do in- and out-of-phase MR imaging to look for microscopic fat? If something is totally characteristic on imaging of something benign like an adenoma or myelolipoma, would the size criteria still apply? The threshold for operating on an adrenal mass varies, depending on what you read in the literature. The 6cm number is more useful as predictor of malignancy, but the consensus in the surgical literature is that masses 4-6 cm ought to be considered for surgical extirpation. In this case, the mass had increased in size 1cm over a 12 month period. 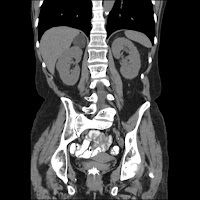 With a rapidly growing adrenal mass, are you comfortable watching it, based solely on out of phase MRI findings? The patient's desires play a role as well, as you know.